"What happens in radiology stays in radiology..."
In this VETgirl online veterinary CE blog, we review tips on improving images, safety and overall success in the x-ray room. An often overlooked room in the veterinary hospital is the radiology room. It is dark, quiet, and often tucked in the corner of the hospital. 1) Positioning, Positioning, Positioning. The best radiographs are taken with appropriate patient positioning. Fancy, expensive x-ray equipment will not correct poor patient positioning. Poor positioning can lead to difficulty interpreting the radiograph, a waste of owner money, and even an incorrect diagnosis. One of the top mistakes we see at VETgirl? Not doing enough radiographs and including enough of the thoracic inlet (for chest radiographs) or pelvic region (for abdominal radiographs). 2) Reducing Exposure. 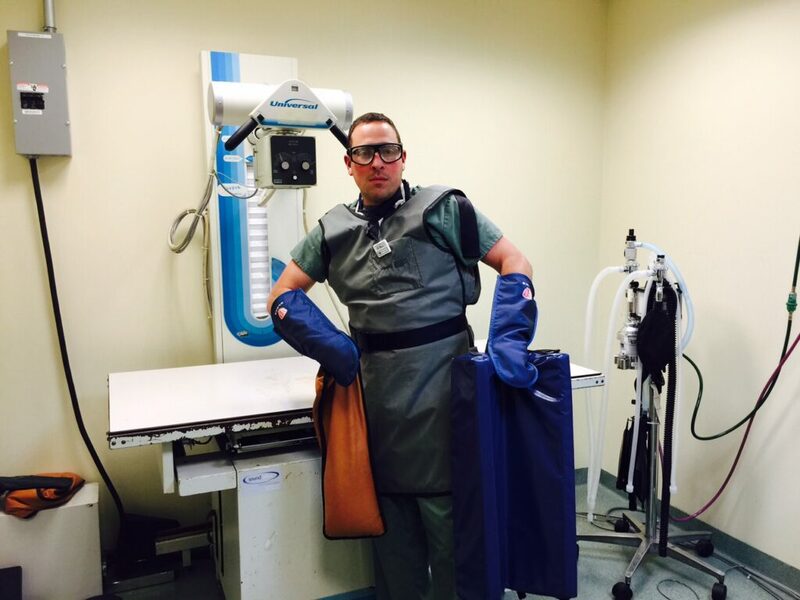 VETgirl can not over emphasize the importance of reducing radiation exposure. The veterinary staff must understand that reducing your exposure will reduce harmful effects of radiation. 1 X-Ray a day doesn't sound so bad. But 1 X-Ray per day, 5 days per week, 52 weeks a year, for 30 years...that adds up. It isn't a cool as you think to glow. 3) Personal Protective Equipment - PPE. Say it with me. PPE. The veterinary hospital owner should provide appropriate PPE to protect the staff. Lead aprons, gloves, thyroid shields, glasses, another other equipment should be used to protect the veterinary staff from the hazardous effects of radiation. Importantly, PPE does not make you invisible. Placing your lead glove covered hands in the direct beam isnt a great idea. It decreases exposure to scatter, not a direct hit! 4) Use appropriate restraint. While this may include sandbags, manual restraint, or ties, do not fear the power of sedation. This will not only help with patient comfort and anxiety, but allow for proper positioning - RULE 1! Your technicians will love you. 5) And finally, yes. "Nothing ever dies in radiology." Why does nothing ever die in radiology? Because as they are taking their last, agonal breath from restraint...they are rushed to the ER for CPR. Why should nothing die in radiology? Importantly, because as proactive, good clinicians we recognize that diagnostics may need to wait while patient stabilization occurs. An answer with a dead patient...helps nobody. When in doubt, implement these 5 easy radiation tips to improve your images, safety and quality of care! Don’t forget about collimating to reduce scatter.